My daughter was recovering from a concussion which she is now recovering from post concussion syndrome. She has severe migraine headaches with other concussion symptoms present. We went back to her Dr. and he gave her another MRI, and put her on Depakote ER 500mg tab with bed rest. My question is how long does she have to be on this medication? She says she feels better with her headaches. She thinks the medication is giving her some side effects that she is not liking. She says she wants to go off of this. I was just wondering how long Doctors leave patients on this type of medication for this problem. Thanks for being such a great support system through all of this! Generally speaking, in the world of headache treatment, a patient is taken off of medication when they are are having only one mild to moderate headache per month, that abortive medication readily takes care of. I am not sure that your daughter is there yet. Depakote ER is a good medication for daily headaches and severe migraines. Although I do not use it for post concussive syndrome, that doesn't mean it wouldn't work for your daughter. If 500 mg is too much, ask the doctor if she can back down to 250mg for 2-3 weeks rather than stop it. Then at that point try the 500 again and she may have less side effects. At that point the brain has gotten used to the drug. Generally the main side effect of depakote for headaches is sedation so I advise patients to take it after dinner. Post concussive syndrome can take many months to settle down and unfortunately if patients do not understand this, they tend to get a little impatient and want to stop therapy before it has had a good chance to work. a little over a month ago i hit my head on the right side under my ear, i immediatley had pain in my ear, and by the next morning the pain increased in my ear,and towards my throat in a line from my ear. Headaches started coming and have not left. they re mainly located at the base of my skull where meets my neck.excruciating,..ear symptoms have worsened foginess,buzzing,ringing,cant lay on that side due to pain. pain also in my face above my teeth,hurts to chew,teeth hurt,and also pain up into my eyes. Double vision is increasing. hummm..what else hard to concentrate and focus...went to the dr. and was told lungs and ears clear,i was like why do i hurt so bad...well we will send you for xrays and a cat scan. xrays showed no issues, however ct indciated a retention cyst or polyp nearly 3 cm in my left maxillary sinus area. went to ent dr. started me on levaquin for infection,never had a fever,? ?...fluticasone spray and prednisone, i also take neurontin for fibro,soma and oxycodone. it has been 1 week and i have nooooo relief at all,makes me cry. this is even taking pain meds,headache is still there. any suggestions are welcome and appreciated. it makes you out of your mind,ready to go to er but what are they going to do different? At this point if you cannot get in to see a neurologist soon, then yes ..go to the ER. Although it is VERY rare, I see about one case a year of a trauma causing arterial dissection. Your symptoms are consistent with some sort of injury to the carotid artery and although it may have been mild at first, clearly it is progressing. A CT of the head may not catch an arterial problem that is tiny to begin with. It is excellent for strokes and larger bleeds but an MRA would be better. Similar to an MRI, it will look at the arteries only. Carotidynia means pain in the carotid, but it can radiate to the ear and cause excrutiating pain. 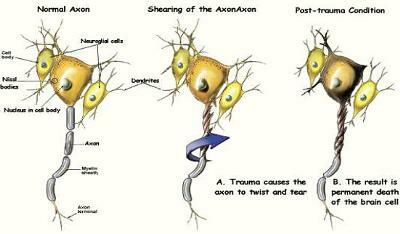 Neurontin is a good choice right now but get to someone who can image the arteries to rule out dissection. If there is no dissection (which by the way smoking greatly increases the risk of this) then you need pain management directed towards this. What are the links between Migraines and Motor Vehicle Accidents? Traumatic brain injury or TBI can occur with motor vehicle accidents. 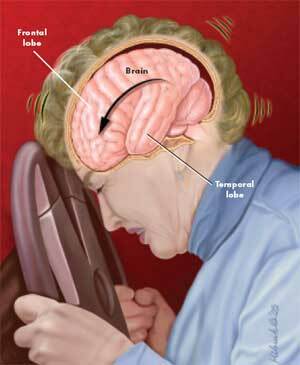 The picture above demonstrates how the brain can suffer when it strikes the skull. In a patient with existing migraine, the migraines can become more frequent and more intense. Usually they return to baseline after a few weeks, but if they continue to get worse then the patient should be seen by a headache specialist. If a person has no history of migraine, TBI could cause them as part of what we call "post concussive syndrome". Usually there is a daily global diffuse headache with breakthrough more intense migraines. If not treated aggressively during the first weeks of worsening pain, these headaches may become chronic. I hope this answered your question. You can read more about TBI at my page on post traumatic headaches. Head Injury: Post Traumatic Headaches? My 23 year old son had a head injury earlier in April of this year on the top of his head. Had ct scan everything ok. Now on May 31 he got elbowed in the eye and had to get 7 stitches. Three weeks later headaches started. Sometimes severe. Took him to the local emergency room and they did a cat scan and did not see anything. Now it is July 21 and severe headaches back, sick to his stomach. Should he get a MRI or wait it out? Although a little unusual for someone to move into post-traumatic headaches after only two concussions, it could happen. Think back..did he have any head injuries in childhood, with other sports? Usually people have 3 or more injuries and then move into headache. He definitely needs to be seen by a neurologist. If these were simple post concussive headaches, they would have disappeared in 1-2 weeks. Months later? Don't wait. He will not improve without treatment. The pain usually is of two types, one is a daily headache that is all over the head. The second is regular breakthrough severe headaches that are migraines. Many patients tell me that the migraines start at the back of the head and then move to behind the eye and are 'stabbing' pain with all the associated migraine symptoms. I would leave the MRI to the neurologist after he/she takes a history. Here is a downloadable list of headache specialists in the USA. These are docs who are board certified in headache and are best suited to deal with post traumatic headaches. In February 2009 I got a concussion from a lacrosse ball shot to the left temple. I had severe headaches, loss of concentration, went deaf in the left ear, trouble sleeping, and a confused "foggy" feeling all the time. A month later most of the symptoms subsided so I went back to playing lacrosse again. I relapsed, which put me back to where I had started. I saw a neurologist and had a CAT scan and MRI done and everything was negative. I rested with no activity for 3 months and began light exercising then progressed my intensity. Recently, (5 months from the initial injury) I am having severe headaches 24/7. The pain level goes up and down. The more activity I do the worse the pain. No medicine (Advil, Tylenol, and a prescription migraine medicine) have worked, or even altered the pain a little. What can I do to help myself? Can I go back to playing lacrosse? You are describing classic post-concussive headache symptoms. It sounds as if you had an acute concussion and perhaps went back to sports activities a little too soon. Generally after a concussion it takes about 6-12 weeks for the brain to heal depending on the person. Since you re-injured yourself (I am not blaming you!) again things flared up and again sports might have been attempted too soon. The problem it that injuries to the brain are cumulative..each injury makes the problem worse. At this point you need to stop all exercise and any activities that would make the brain move around suddenly..for example no amusement park rides or lacrosse. Go back to the neurologist. The medication of choice is amitriptyline or Elavil which really helps calm things down. You will have to be on the medication for several months. It is important to realize that the brain takes months to heal and respond to medication..not days or weeks. Most patients respond at doses between 50 and 150mg but have to be worked up slowly. It is taken before bed due to sedation but helps you sleep. You may also benefit from a short course of low dose steroid but that is for the neurologist to decide. i was playing baseball today with my jrotc instructor and i got hit in the head by the baseball really hard and now i feel reaally dizzy and sleepy and lightheaded and my mom says that im not gonna die and im scared cuase i do not know wnats wrong with me. I have been out of town so I am sorry this was not answered sooner. You have the signs and symptoms of a concussion. If you are not better by now (which is 5 days later) then you need to tell your parents and should be see by a doctor as soon as possible. Concussions usually improve over 1-2 weeks in terms of dizziness, headache and drowsiness. CAN POST CONCUSSION SYNDROME GIVE YOU STRONG PRESSURE AND THROBBING PAIN IN YOUR HEAD? IF SO , WHAT TYPE OF MEDICATION DO YOU RECCOMEND? WHEN WILL SYMPTOMS GO AWAY? Post concussive syndrome does usually present with a pressure type headache and may have breakthrough migraines. You can read full information about post concussion headache here on my site. I do recommend amitriptyline on a tapering dose up to 50-75 mg at night. You have to start low at 10mg and work it up. Be patient as it will take a few months to get things under control. I would also advise that if you are having daily headaches from this, that you consider going to the headache clinic at Johns Hopkins. Keep regular sleep hours, if smoking cut back and no more than 1-2 cups of caffeine per day as these things all make headaches worse. I hit my head 5 months ago bending down to get something. I have had headaches everyday and a huge throbbing pain since the day it happened. I have went to the doctor and i have had a CT scan and everything is normal. Is it normal for the pain to still be there after 5 months?? No this is not normal. Please see your doctor about this and if they cannot help, ask to see a neurologist.